I’m on vacation! I’ll be out for two weeks and when I come back, I’ll still have another three weeks of vacation left for the year. Let’s travel, people! I started the day with a chocolate chip cookie, peanut butter cookie, and a chocolate peanut butter bar from Baker and Banker. I couldn’t pick just one. 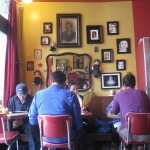 Then decided on a whim to check out Red Door Cafe which is hands-down a tiny little gem of a restaurant. Everyone in the joint, who’d been waiting outside since 9:30am, were locals trying to get a whiff of the action. Finally we prevailed. Well worth it. The food was light–not overwhelming, tasty–not salty, fresh–hand-picked from the garden. Damn! Love this place. We had a little conversation going on our side of the cafe. 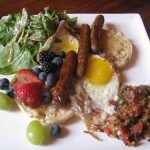 We agreed without a doubt–best breakfast fare in the city.